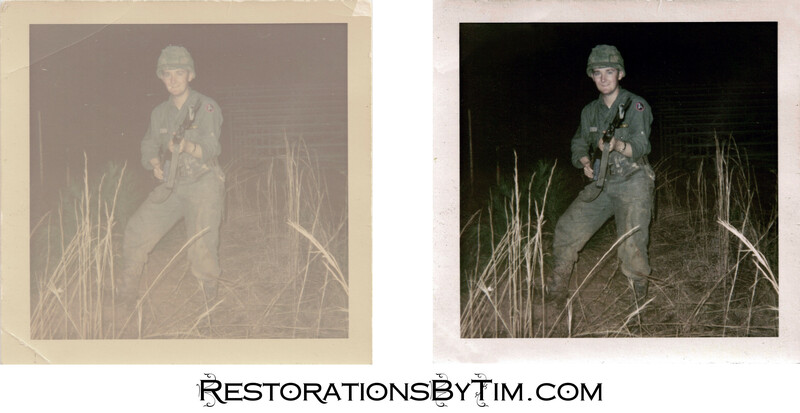 Touch-Ups: Color Enhancement | Photo Restorations by Tim G.
This soldier is in the thick of his basic training for Vietnam. Adding color where there is none is a trick, but teasing out colors that are there and hiding is not too difficult. Playing with a few sliders and trying on a few automatic color enhancers can quickly produce striking results. In this instance, I bartered a little extra work for permission to post the picture here. Creases and negative dust specks have been removed.